The Spotify iPhone app has been approved. With this app, I will now be able to carry 5 million songs in my pocket, and every week thousands more songs will be added to my collection automatically. This is the proverbial celestial jukebox – the great jukebox in the cloud that lets me listen to any song I want to hear. This is going to change how we listen to music. When we can listen to any song, anywhere, any time and on any device our current ways of interacting with music will be woefully inadequate. Shuffle play with 5 million songs just won’t work. Listener’s paralyzed by too much choice will just go back to the Eagles greatest hits album because its easier and safer than trying to find something new. People will start to wonder “What good are 5 million songs if I only listen to the 100 that I listened to in high school?” The new challenge that these next generation music services face is helping their listeners find new and interesting music. Tools for music discovery will be key to keeping listener’s coming back. Five years from now, the most successful music sites will be the ones that have figured out how to help people find new music. This entry was posted on August 28, 2009, 9:46 am and is filed under Music, playlist, The Echo Nest. You can follow any responses to this entry through RSS 2.0. Both comments and pings are currently closed. You’re absolutely right. Filtering all this stuff in some relevant way to individual listeners will be the key. Once the music discovery process expands from artist/genre-based information, to include a context/listener-based process (age, taste, mood, time of day, etc), then there will be progress. Still…no matter how many songs you have access to, you can only listen to one tune at a time. So which one will it be? right here. right now. 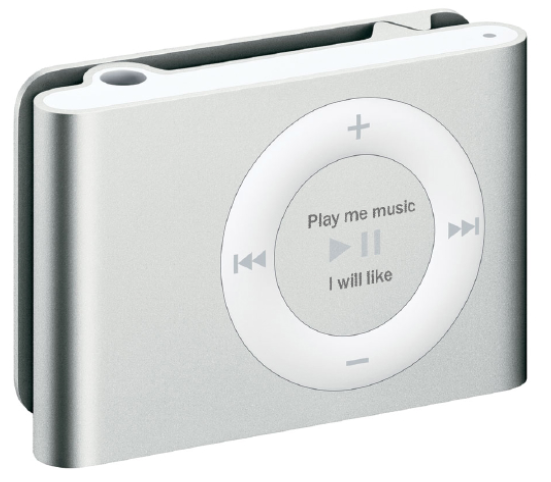 Dan, and others, my idea — which I adapted from one that Paul himself originated in 2006 — was that this iPod would have a bluetooth connection to your shoes (a la Nike/iPod) so it would know if you were walking/running/driving/sitting etc. It would have some kind of galvanic skin response detector in the button, so it would know your mood. It would, of course, have access to your entire listening history, and recommendations from your friends/’neighbours’ (in the last.fm sense). Sure, let’s add geolocation in as well — why not? And it would have one cracking algorithm to take all these feeds and determine _exactly_ the _one_ song you’d love to hear next. Patent pending. because people could be spending their time and money developing useful technologies instead of endlessly refining a machine which will a)never beat human intuition anyway and b)make no difference to anyone’s actual life ever? This is the same kind of over-refinement of a perfectly good technology as cosmetics companies spending billions on incremental improvements to shampoos and moisteurizers, and Gillette fitting more and more blades onto razors, and so on and so on. My soccer shirt doesn’t need special EZ-breathe(tm) and ClimaLite(tm) fabric, it’s just a shirt, I’ll get by without it! Please excuse the rant but as a music fan I don’t mind occasionally listening to music I don’t love. Sometimes I just like it, sometimes I don’t even like it. If all you eat is sweets, you’re eventually gonna feel sick. Ally, I’m sorry I didn’t make it sufficiently clear that my whole concept was a parody and a projection-towards-absurdity, intended to make almost exactly the same point as you are making. About that picture, a machine that knows, which music I will like, will also know, if I want to listen to music … so there’s no play button necessary. David, I think these machines will have a direct connection to our brain, gaining information about the music we would like to listen to. In the next step, these machines will not only access all music that has ever been created, they will be able to create exactly what we want to listen to, in a sense that they make us feel the way we want to feel. Hehe, and that’s the point where music will lose lots of its value … since these machines will also be able to create this feeling without the use of music. Yeah, you’re right, Daniel, the play button is just a ‘placebo’ user interface widget. It doesn’t really do anything, but in our market testing we found that the majority of users liked to have the feeling that they were actively ‘in control’ of the device, even if they weren’t. So we figured, give them a button to help exercise their thumbs; what harm can it do? The prototype I’m using often plays me movements from John Cage’s 4’33”. I think it shuffles them in different order to keep me interested.